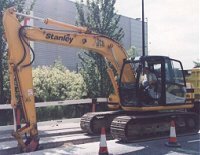 Stanleys have a range of established methods for the rapid installation of electricity cables whilst minimising the impact on the environment. 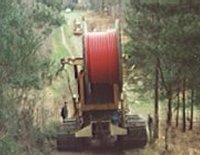 Highlighted here is the use of a moleplough to lay three 11KVa cables simultaneously through heavy woodland. The cables, sand surround and protection system are automatically installed at the same time. A full compliment of road and verge trenching and excavation equipment is also available for use in urban locations.